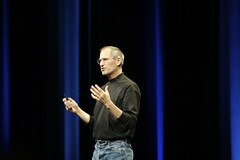 Steve Jobs was rushed to the ER just a few hours ago after suffering a major heart attack. I have an insider who tells me that paramedics were called after Steve claimed to be suffering from severe chest pains and shortness of breath. My source has opted to remain anonymous, but he is quite reliable. I haven't seen anything about this anywhere else yet, and as of right now, I have no further information, so I thought this would be a good place to start. If anyone else has more information, please share it. What appeared to be a scoop for citizen journalism ended up being nothing more than a farce. Failure to check a reliable source led to this becoming a major story, leading to Apple's stock plunging ten percent. What this story shows is that the Web 2.0/Social Media distribution has become an integral part of our news delivery system. Sites such as Twitter, Digg etc were spreading the word and with no immediate confirmation or denial just acknowledgement that, true or false, this was a big moment for citizen journalism. With this unverified it was down to the reader to evaluate and the signal for gossip to commence.